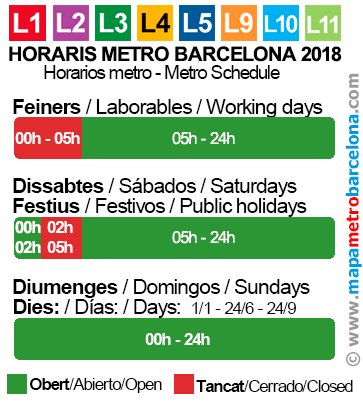 Here are the schedules for Barcelona Metro and other public transportion in Barcelona. 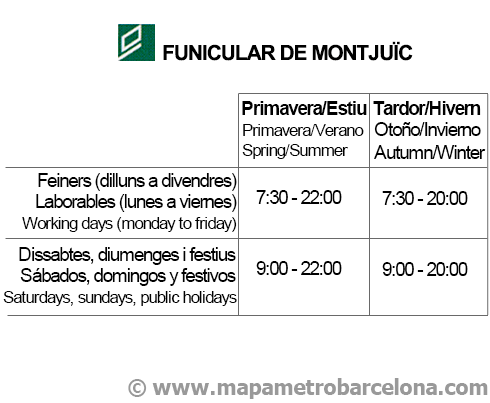 On Workdays (Monday to Thursday) and Holidays days: From 5:00 a.m. to 12:00 midnight. On Fridays and eves of public holidays: from 5:00 a.m. to 2:00 am. On Saturdays: From 5:00 a.m., continuing into the next day. On Sundays: Opened all day until midnight. 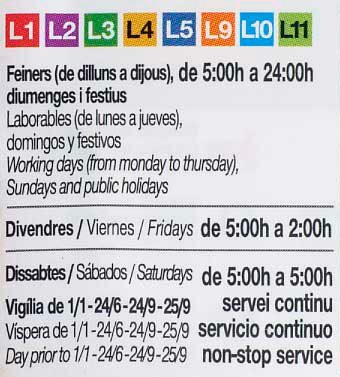 Holidays: January 9st, June 24th and September 24th: From 5:00 a.m. continuing into the next day. Has more simillar days but change every year, maybe you can find more information in the official page. December 24th: from 5:00 a.m. to 11:00 p.m. In the next image you will find the same information but in a different order. Included are schedules for all subway lines.